Hello is Joshua Fried and Rolf Conant. Electric guitar of 4: Jay Sherman Godfrey. Bass on 2 & 5: Eric Sanko. Female Vocal on 3: Robin Goldwasser. Produced by John Flansburgh and Joshua Fried. Mixed at hello Studio, Brooklyn with Pablo Goldstein. The brainchild of John Flansburgh's Hello CD of the Month Club, Hello The Band was born originally of a desire expressed by Joshua Fried. It seems Fried saw the name "Hello Records" and instantly wanted an excuse to cover glam rocker Garry Glitter's classic, "Hello Hello". With this one song in mind, and lots of free time, Fried and Rolf Conant (Flansburgh, Conant being his middle name and Rolf being "a good German" name. It should also be noted that Flansburgh used the same pseudonym in the rare fanzine "Art In Context", which he produced with then TMBG soundman Bill Krauss). The collection of songs on Hello The Band is eclectic at best. The idea of the project was for both Fried and Flansburgh to return to their semi-performing arts, 1980's New York styles. The influence of that time period is apparent in the opening instrumental, "Sodium Mask". From here Flansburgh takes us on one of his rare but brilliant falsetto trips with a stunningly bizarre "Since You Joined The Corporation". We are treated to a hero worship to Tom Vu (who to the best remembrances of Brooklyn residents was a sort of an Asian Tony Robbins) in an 80's style bop known as "Town To Town". The next track, "Lullaby To Nightmares", is the one and only known recording that features vocals by Fried, who is noted for his production and remixing skills, as well as his performance art. What he had never tried before, and hasn't since, was vocal performance. The EP, and the career of Hello The Band, ends brilliantly with "Hello Hello". The biggest points of note about this track would have to be the fact that one, it is a cover, and two, it appears on the Mono Puff "Unsupervised" album, being credited to Mono Puff. 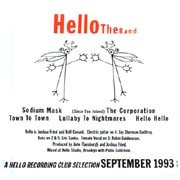 The Hello The Band project was slated to do a "return" disc, tentatively titled "The Hello Family" which was axed when Hello Record Club folded in 1996.